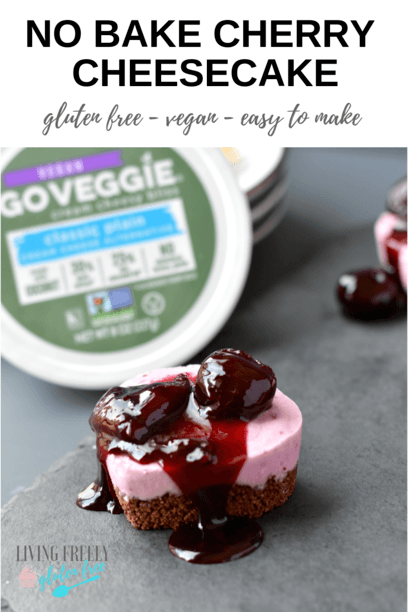 This Easy No Bake Vegan Cheesecake Recipe is sponsored by Go Veggie Foods. Go Veggie is a brand that I love and trust. 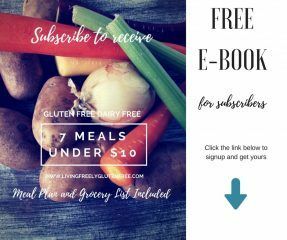 Here at Living Freely Gluten Free I believe in sharing all of the gluten free goodness. Thank you Go Veggie! This post contains affiliate links. 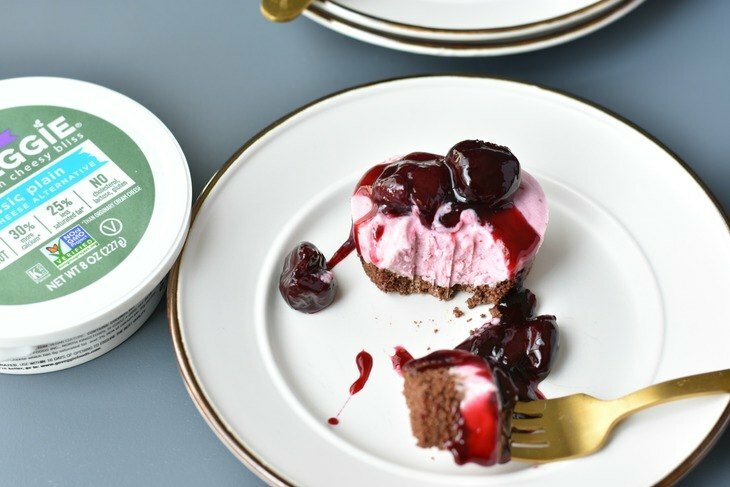 Cherry Cheesecake is a classic family favorite. I have been looking to create an easy no bake vegan cheesecake recipe with a gluten free no bake cheesecake filling. I love this simple no bake cheesecake because not only is it naturally gluten free, but its a vegan cheesecake no cashews. So, you can enjoy this recipe and share it with friends since its free of many allergens. While I love a good traditional cheesecake, simple no bake cheesecake is just so darn easy. There is legit labor involved in a baked cheesecake. However, this easy no bake vegan cheesecake recipe literally takes minutes to throw together, but the flavor is so phenomenal, everyone will think you slaved over it. 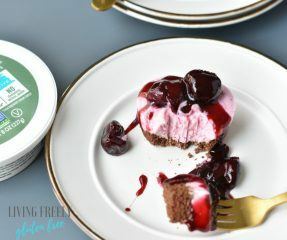 The cherry topping is optional, but it really makes the gluten free no bake cheesecake filling standout. How beautiful is it as the sweet cherries drip off of them? 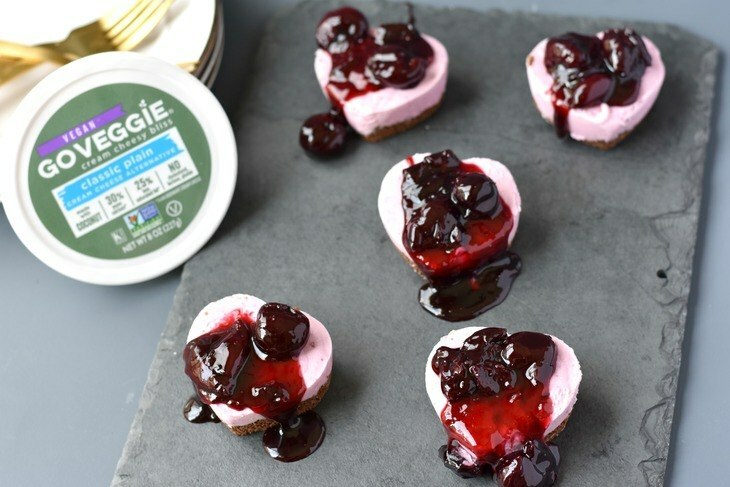 I chose to use this easy no bake vegan cheesecake recipe as mini cheesecakes. You can totally make one regular cheesecake with it by using a springform pan instead of a cupcake pan or silicone mold. It’s up to you. I love the little mini hearts for Valentines Day. How do I make this Simple No Bake Cheesecake? It is so fast and easy to make this simple no bake cheesecake. Start by making your crust. You can use any gluten free cookie for the crust. Crush the cookies with a food processor. I put it on high for about 45 seconds. Then pour the crushed cookies in a bowl and pour the melted coconut oil in the bowl. Stir it well with a fork until its all blended through. Pour the crust mixture into your molds or pan and press down to make the crust firm and flat. Set aside. Here is the mold I used BAKER DEPOT 6 Holes Heart Shaped Silicone Mold . Now we make the gluten free no bake cheesecake filling by adding the coconut cream, Go Veggie cream cheese, sugar, lemon juice, and cherries to a blender. Blend on medium high speed for about 1 minute, or until the mixture is creamy. Pour the gluten free no bake cheesecake filling on top of the crust. If you are making mini cheesecakes you can spoon it onto the crust. Place in the freezer and freeze overnight, or for at least 4-6 hours. Take out 15-20 minutes before serving and store again in the freezer if you have some left over. 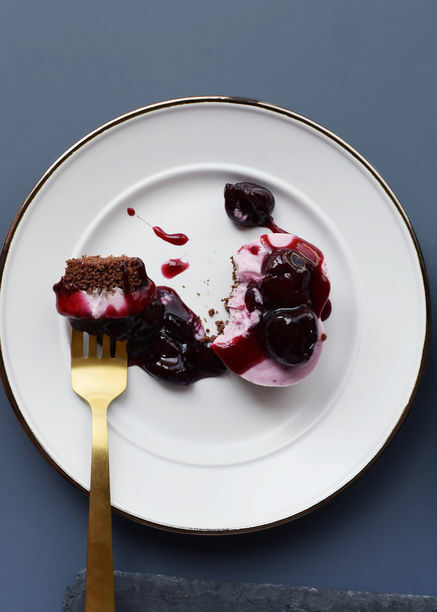 To make the cherry cheesecake topping, add the cherries, sugar, lemon juice, and vanilla to a sauce pan. Turn on the stove to medium/low heat and stir well. In a bowl, add the water and tapioca starch. Stir until the starch is dissolved. Set aside. Bring the cherry mixture to a simmer and cook 3 minutes. Add the water/starch mixture and cook for an additional 2-3 minutes. Remove from heat and allow to come to room temperature before putting on top of the cheesecake(s). So when you have a craving for a cherry cheesecake, know that this gluten free no bake cheesecake filling is the perfect easy to make no bake vegan cheesecake recipe, especially if you have a nut allergy and need a new vegan cheesecake with no cashews. You are going to love the simplicity of this recipe without compromising any flavor. Enjoy! This simple cheesecake is free of many allergens and tastes amazing. In a bowl, blend the crushed cookies with coconut oil. Spoon into the bottom of your mold or pan. Press down firmly to flatten and form the crust. Set aside. In a blender, add the cream cheese, coconut cream, sugar, lemon juice, and cherries. Blend until creamy, about 1-2 minutes. Pour or spoon mixture onto cookie crust and freeze overnight. Take the cheesecake out of the freezer to thaw for about 20 minutes before serving. Store in the freezer if some is left over. In a bowl, combine the starch and water. Stir until the starch dissolves. With a sauce pan on medium heat, add the cherries, lemon juice, vanilla and sugar. Stir well and bring to a simmer. Add the water/starch mixture and cook for about 3 minutes. Remove from heat and allow the cherry mixture to come to room temperature before spooning onto the cheesecake(s). Enjoy! Absolutely!! I have done that in another recipe before.